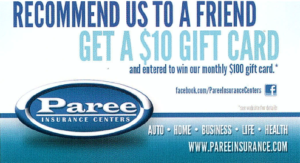 At Paree Insurance Centers, we exceed expectations. Anyone can promise great service, but not everyone can deliver it. At Paree Insurance Centers, we’ve built a culture around doing the right things. But don’t just take our word for it. Read these client testimonials to see exactly what we mean.